The Golden Retriever was developed in Scotland at the highland estate of Lord Tweedmouth. The Flat-Coated Retriever, the Tweed Water Spaniel, and the Irish Setter were a few of the original descendents of the Golden Retiever. Lord Tweedmouth was trying to produce a dog that would be an excellent scent hunter, a retriever, and also be loyal and even-tempered in the house; and he accomplished just that. Lord Tweedmouth was especially partial to yellow dogs and gave most of the other colored dogs away, hence why they come only in shades of gold. They were officially recognized as their own distinct breed in 1920. A Golden Retriever is an excellent family pet. They get along well with everyone, including children and other pets. They are happy-go-lucky, gentle, and very friendly. They are intelligent, trainable, and obedient, and they want to please their owner. Golden Retrievers were bred to work, so they love to play games and have fun outdoors. They're athletic and fast on their feet. It's no surprise they are one of the most popular dogs in the world as they are beautiful, sweet, and loyal. 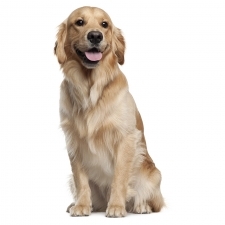 Goldens usually weigh between 50 to 80 pounds and stand approximately 21 to 24 inches high. They are a strong, medium to large sized dog with a well-proportioned body. They are especially known for their long and silky coat, which comes in colors of light golden, golden, and dark golden. Golden Retrievers are the 19th most popular dog registered with America's Pet Registry Inc. They are popular guide dogs, police dogs, and hunting dogs. Some famous Golden Retrievers were Buddy from the movie Air Bud; Comet from the TV sitcom Full House; Shadow from the movie Homeward Bound: The Incredible Journey; Duke from Bush's Baked Beans commercials; and Liberty, who was owned by President Gerald Ford.